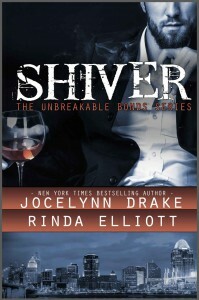 Shiver is the first book in the Unbreakable Bonds series, and I have just found myself a whole new series that I would like. No, actually, scrap that. I don't want this series, I NEED it!!! This story is about Lucas and Andrei, self-made millionaire and bodyguard. This book is serious and yet also amusing. They both make a comment about how corny their relationship is, a film was even made about it. This made me chuckle out loud, even as I was concerned about what was going to happen next. I love Lucas - his strength, his friendships, and how he isn't prepared to let others do things for him that he isn't prepared to do himself. He is also an arrogant, high-handed jerk at times, but will admit to when he's wrong. As for Andrei, he is a sweetie. Okay, so that may be the wrong word to describe an underground fighter/bodyguard, but he is. These two have a rocky relationship with a HFN ending, but their relationship is very strong and I can't wait to see where it goes. The mystery side was enough to keep me guessing (although I'm happy to report my instincts were correct lol). There was plenty of action, as well as action between the sheets. Although the main focus of this book was Lucas, you also get a good glimpse of the others and potential partners for them. As for Rowe, I both want to and don't want to read his, because I think my heart might get broken before I get a HEA! Excellently written, with no editing or grammatical errors that disrupted my reading flow, I adored this book. The dialogue flowed and felt completely natural whilst reading. I was intrigued and enthralled, and thoroughly loved every word. Absolutely recommended by me.